Stockholm is often called the most appealing city in Scandinavia, and it’s easy to see why. Built on 14 islands and connected by over 50 bridges, with a high concentration of natural spaces, crystal clear air, and an archipelago of some 24,000 islands and islets, it deserves it’s self proclaimed title of Capital of Scandinavia. But we were expecting that. It turns out that compared to the rest of the world, the percentage of blondes in Scandinavia is only slightly higher, with Finland having the most. Who knew? Sweden has a well-founded reputation for being green, clean and natural. In 2010, Stockholm was the first European city designated as a Green Capital, with water so clean, you can fish within the city. It’s also the most pollution free, with some of the best air quality, and no wonder, with over 1,000 green spaces, constituting a full 30% of Stockholm’s total area. The food we had in Stockholm was some of the freshest we’ve ever tasted. This is purely anecdotal, but I swear that a Swedish potato does not taste the same as the other potatoes of the world. It’s just that much more natural and enjoyable. So, it was quite a surprise to see so many Swedes lighting up cigarettes on the streets. It was definitely enough to notice. Strangely though, the reality, is that Sweden has the lowest smoking rates in all of Europe, with only 11% of adults reporting as smokers in 2011. Maybe they stand out more, because there are less of them? Since the Fika is a national past time, it’s no surprise that Stockholm is full of atmospheric cafes. There’s a lot of variety, from historical cafes to chain coffee houses. The one thing they have in common, is that the tables are not cleared very often (by staff or customers) resulting in unoccupied tables with dirty plates. 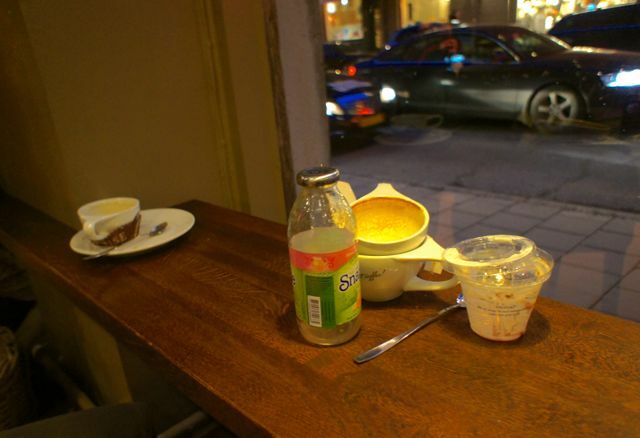 90% of the time, we couldn’t find a table (in our hotels or at a cafe), that was completely clean and cleared of plates. We would move them to the side to join the pile of other used dishes and garbage. It was really the only way to sit and drink a coffee at a table inside the cafe. Things were cleared eventually, but definitely at a much slower pace than Seoul, where everything happens at hyper-speed, and dishes are removed before you blink. Have you ever traveled to a country that didn’t meet your preconceived expectations? What surprised you? oh my gosh… that is more than a week’s budget for eating out for me! more like 2 weeks! I echo your feelings about the fresh food. The very best salmon I have ever tasted was here. Wine and alcohol is expensive in Sweden, and more so in NOrway. That is why you have a lot of drunken Scandis on the ferries where the booze is duty free. Not to mention the young very drunk Russians who sat outside my door giggling and chatting at 3 am in the morning on the Talliin – Stockholm route!! Hmm, thank goodness for this upbeat post on Stockholm, I was getting a little nervous reading about your time in Scandinavia as I sit here trying to arrange our own Scandinavian adventure, with two young kids, in the middle of winter! For the first time ever I am planning way ahead, because we thought it would be fun to take our soon to be 7.5 and 4.5 year olds to the ‘North Pole’ next Christmas! I think you have saved my skin though because in my ‘Draft Itinerary’ I had skipped Stockholm but had 2/3 nights in Hell-sinki (your words, ha) and now I have altered my draft just before trying to book our flights as Helsinki is not looking appealing except for those fantastic churches (I say trying, because we have enough frequent flyer points for 4 round the world tickets, but it’s not easy finding 4 allocated FF seats on any one flight, hence my booking 11 months in advance). The Draft (from Australia) now looks like this: Australia to Japan (5 nights) to London (3 nights) to Bergen Norway (3 nights) then via the apparently world renowned Bergen to Oslo rail (7hrs day trip, then 3 nights in Oslo) to Rovaniemi Finland (‘Santa Village’ for a few nights including Christmas for the kids, then an Ice Igloo for a night (maybe, as they have them at the Santa Village), then a glass igloo for a night or two just out of town for a hopeful ‘Northern Lights’ sighting – Yes I read your posts on this and liked your advice, I can’t image sitting out with young kids in -25 degrees for long and then potentially being disappointed – The Glass Igloos have heated floors and bathrooms!!!) then to Stockholm (3 nights), Copenhagen (3/4 nights including NYE) – The return trip home will probably include a few nights back in Japan (opposite end of Japan) and a week in Hawaii to thaw out. Rovaniemi is not as remote as where you went at Ivalo and Engholme Husky but it will be right in the middle of winter and so the -20 or so will be cold enough for us! I really have my fingers crossed that I will be able to report back some very positive experiences, because as you say it will not be a cheap trip! Thank goodness for the Frequent Flyer points saving us at least $15,000 in airfares (it’s peak season, Australia is a long way, and the kids are already full fare)! Wish us luck and stay tuned. Wowww!! Trip sounds amazing, and I’m glad you chose Stockholm over Helsinki. I think Helsinki could be okay in the summertime, but Stockholm is amazing in any season (and there was sunshine every day), instead of haze. I have seen some amazing pics of the northern lights from Rovaniemi, so it’s totally possible to see them there. In fact, while we were way up in Karasjok, people as far south as Scotland were seeing the aurora. It’s really just a matter of timing and luck… so I sincerely hope you have better luck than us! 😉 At least you’ll be warm in an igloo. SO wish we had done that. Yes I am getting excited already (my wallet is not), due to ticket rules I have cut out London (have been many times) and we’ll have to get our own transport to Stockholm from Copenhagen. We’ll fly into Honolulu and spend time there and have not chosen a second Island yet. We spent a week in Maui with the kids in 2012 and loved it. I was considering ‘The Big Island’, have you been there? I wanted to come back through Soul rather than re-visiting Japan but my Wife was not keen, she doesn’t know why! I will have to get her reading your Blog. As it turns out the ticket won’t let us re-visit Japan so we will now go to LA for a couple of nights on the way to Hawaii. Our points are with Qantas (One World Alliance) and yes I have noticed different taxes for different routes but they are not too bad for this itinerary. We’ve been to the Big Island…it has a very different vibe than the rest of the islands. Active volcanos and black sand beaches. Our favourite experience there was a tour up to the peak of Mauna Kea…we were giddy with the lack of oxygen! (you have to book this in advance).